Download the latest pdf-version of the checklist in English and Dutch on the Project Management page. Many projects in organizations just go wrong without any need. This Dragon1 IT Project Auditing Checklist helps you in preventing IT Projects from failing. Of course success is NOT guaranteed, but at least you can benefit from 16 lessons learned from this project checklist. Any of the 16 questions on this list once was the sole reason for a project to fail. How does this checklist work? To prevent an IT Project from failing to make sure that at any time all questions can be answered with YES. If one of the questions can be answered with NO, stop or pause the IT Project and fix the issue. Is the concept, module, system, solution or structure that this project will design or realize clear to everyone (the stakeholders) in and around the project? What is the name and definition of it and where is a document with a brief description and visualization (design sketch or drawing) of the concept, module, system, solution or structure? Is an owner/client or one mandated business owner for this project known? And what is his or her name and function? Is an assignment to create a business case or to start up a project available? And what are its name, version and archive location? Is a valid and approved financial business case available? And what is its name, version and archive location? Is a valid and approved program of requirements (POR) and terms of reference (TOR) available? And what are its name, version and archive location? Is a valid and approved architecture or design document available (not created by the implementation partner)? Is an A0 sized architecture visualization available (a complete solution overview, landscape, blueprint or roadmap) in the design? Is a valid and approved project charter, project document (PRODOC) or plan of approach for the realization (apart from the design) of the solution or structure available? And what are its name, version and archive location? Is a test plan and implementation plan available and was a method used to create these plans? And what are their names, versions and archive location? Are changes in plans and document contents, versions and history well managed for the business case, architecture / design, a program of requirements and plan of approach? Are the business case, architecture / design, a program of requirements, plan of approach and other documents visually aligned in a project landscape map? Is a visualization of the product breakdown structure, including a financial sheet and planning sheet, aligned with the solution architecture, available? And what are its name, version and archive location? Is a visualization of the working breakdown structure, including a financial sheet and planning sheet, aligned to the solution architecture, available? And what are its name, version and archive location? 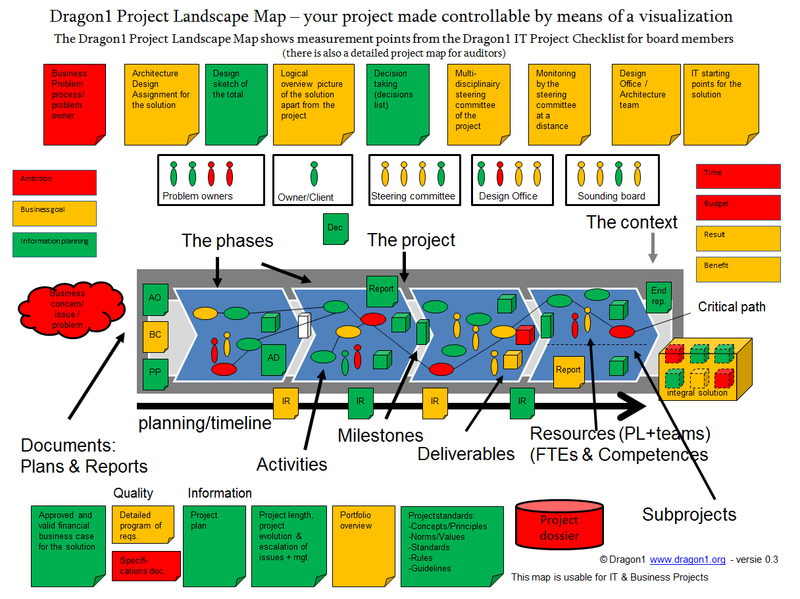 You can use the project landscape map below to report the current status of your project based on the outcome of a review using the checklist. And next take decisions using this overview and with that improve the situation of the project. Many projects in organizations just go wrong without any need. This smart Dragon1 IT Project Auditing Checklist helps you in preventing IT Projects from failing.